Lady Macbeth isn't an easy watch. It's not the kind of film that makes you feel good. It is stunningly uncomfortable as we don't get to feel good about anyone or anything we see. However in that discomfort there is a hypnotic energy which makes it hard to look away. Lady Macbeth is being sold as a rebellious romance. Nothing could be farther from the reality of this story. It is a study in depravity, how isolation, abuse, neglect, and violence spawn further isolation, abuse, neglect, and violence. It is a tragedy about a woman who destroys herself in reaction to her world attempting to destroy her. And at the centre of this is the remarkable Florance Pugh. Her approach to Katherine is complex and exciting. She could have easily just played "crazy" but she doesn't. Despite the film's rather stingy running time, you feel her descent through her fears, joys, complications. She is a product of the world around her and the film shows us both her victimization and her cruelty. And Pugh shows it all in incredible relief. This is the stuff that breakthroughs are made of. She's not alone. Also strong are Cosmo Jarvis and Naomi Ackie playing opposite Pugh. The film is an exercise in restraint as director William Oldroyd keeps his story telling to the bare minimum (perhaps, due to the nature of this story, that's for the best) and his cast does to. They do good work letting their faces tell the story, keeping much of it just under the surface. Oldroyd builds tension by just letting us see moments, with most of the horror just underneath what we see. 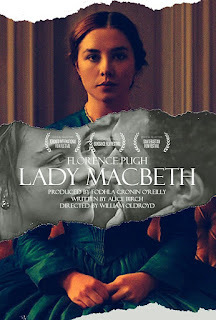 Lady Macbeth is upsetting and captivating and its star is definitely the latter. It is a great film for when you want to be pushed to understand how things can go bad. The film makes no excuses but takes no prisoners. We can't hate anyone, just feel raw wondering how anyone would react in that set of circumstances.